Soulpepper presents their successful version of Neil Simon’s the Odd Couple in Toronto’s Distillery District’s the Young Centre for the Performing Arts. The Odd Couple is one true masterpiece beloved for generations throughout the 20th century, and with good reason. I’ve loved it since my childhood, and have seen the film starring the indelible duo of Walter Matthau and Jack Lemmon countless times. Its dialogue is sharp, well-paced, sparkling with outrageous one-liners and tied together with distinct conflict and resolution. It’s pretty much perfect. I overheard some girl during intermission comment that “it’s not very deep,” which couldn’t be further from the truth. It’s so easy to dismiss comedy because it just makes us so happy, and laugh so hard, but of course, that was just after the first act and the real heartbreak hadn’t happened yet. As with all of Simon’s plays he points out his characters’ foibles and makes them so real that it is hilarious because we can relate to them so well. My partner with me, Bill, couldn’t resist comparing the two of us to Felix (Diego Matamoros) and Oscar (Albert Schultz), the two bachelors at the centre of this story. The plot is tied together by weekly poker games held in Oscar’s home where a bunch of middle-aged men gather for some reprieve from their wives. And of course they are free to drink beer and make a mess because Oscar couldn’t care less. He pays someone $1.50 an hour to clean up after him. One night, Felix is late, which is so unlike him. Everyone has some idea as to what might have happened, but a phone call to Felix’s wife reveals that he’s actually M.I.A. and has already threatened suicide via telegram after they have agreed to separate. One-liners like these which reveal so much about these characters’ dispositions, pepper the text, holding Oscar and Felix in such sharp contrast: Felix is so considerate, neat, and frugal that it is grating, and just gets in the way of Oscar’s attempts at having a good time helping Felix move on. Even though he knows himself how hard that can be, having gone through it not six months prior. The real soul of the story is the hard fact that the relationship between this “Odd Couple” is not much different from the marriages they fled. Soulpepper’s production has it’s own edge. I’ve mentioned how familiar I am with the 1968 film, but now seeing it performed in the twenty-first century seems disorienting because it is the first time I’ve seen it as a “period” piece, taking place in its original setting, a now bygone era. Funny to think that for years to come the works of Neil Simon may be performed in this way, just like the parlour comedies of the late 19th century, which we modern audiences consider quaint and foreign when removed from their original context. Of course, Simon’s plays were very accessible and current when they were originally written, in a time when divorce was merely a growing trend. Simon pays tribute to these roots by naming two sisters who live in Oscar’s building Cecily and Gwendolyn, the names of Oscar Wilde’s heroines in The Importance of Being Earnest. Seeing the Odd Couple now reminds me of the popularity of Mad Men and other contemporary works taking place in the mid-twentieth century. I’m not just talking about the nostalgic appeal, but the potency bestowed on universal themes and issues so close to home when they are framed by a world so different from our own. This production is a must-see for theatre-lovers of all ages, and I mean, how much of a surprise is that? Soulpepper reliably delivers thorough, faithful, and spirited presentations of the most significant works of theatre of all time. Whether it’s challenging, alienating, or makes you laugh so hard it hurts, a bit of pepper for the soul somehow makes it all taste that much better. 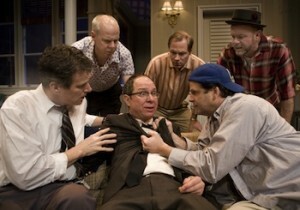 Photo of Kevin Bundy, Oliver Dennis, Diego Matamoros, Derek Boyes, Albert Schultz, Michael Hanrahanby Cylla von Tiedemann.